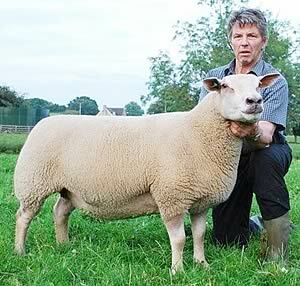 with his Skipton 4,000gns Charollais two-shear ewe. The couple headed the prices at an invigorating 4,000 guineas with a December, 2006-born two-shear ewe (DG7304), by Ash Charollais Filibuster, a Gold Award ram purchased by the Marwoods at the Worcester Premier Sale in 2005 for 2,100gns, whose parentage goes back to the celebrated Inglis flock of Geraint Lloyd. Scanned for twins in December by Parkgate Insignia, bought last year at Lanark from Herbie and Alan Kennedy, she has been the Foulrice show ewe for 2009, standing second to the champion at this year’s Great Yorkshire Show. She was also second at the Royal Welsh, won her class at Ryedale Show and was part of the winning group – along with Ballynoe House Isaac and the Foulrice champion show ewe DG8064 – at both Ryedale and Great Yorkshire shows. The top price female moved to the south-west when acquired by Mike and Mel Alford, of Foxhill Farm, Blackborough, Cullompton, Devon. The Alfords purchased a number of Foulrice females at Skipton, which will be used for breeding purposes in their well-known pedigree Charollais flock, first established some five years ago. They paid 2,650gns for a 2005-born ewe (DG5497), the dam of their top price Skipton purchase - by Thackwood Dundee, bought at Kelso as a shearling for 2,000gns - and scanned for triplets by Ash Charollais Filibuster. The Alfords also had successful bids for two further two-shear Marwood ewes - 1,850gns for DG7628, by Foulrice Eboracum, in-lamb to Parkgate Insignia, and 1,500gns for DG7192, by Thackwood Dundee and scanned for twins by Ash Charollais Filibuster. A 2006-born Foulrice ewe (DG6216), by Rutland Ensign, itself sired by Foulrice Chieftian – sold as a Silver Award shearling at Worcester Premier for 4,200gns - became the fifth Marwood female to achieve four figures when knocked down for 2,000gns to South Welsh breeder A Davis, of Lllandeilo, Carmarthenshire. The Marwoods sold a total of 129 females at Skipton at an average price of £569. Their Foulrice Charollais flock was established 27 years ago and continues to sell successfully to pedigree breeders, though their bread and butter trade is sound commercial rams for the production of a quality end product. The couple have sold rams throughout the UK. “As our numbers had reached 570, we felt it was time to make a reduction, as well as reducing our workload at Foulrice,” explained Mr Marwood. All their Skipton ewes were presented on the Heptavac P+ system and were Bluetongue vaccinated in May. All were AI’d the same month and those which returned to service were served naturally by either Filibuster or Edstaston Headmaster, purchased as a lamb for 1,900gns and the shearling ram class winner at the Great Yorkshire Show. All ewes are due to lamb in December.